1.1 "Abbotts", "we", "our" or "us" means Abbotts (S.W.) Limited, Company Number 04678740 whose registered office is situate at Lowin House, Tregolls Road, Truro, Cornwall, TR1 1NA and whose trading address is situate at 17 Barncoose Industrial Estate, Redruth, Cornwall, TR15 3RQ. 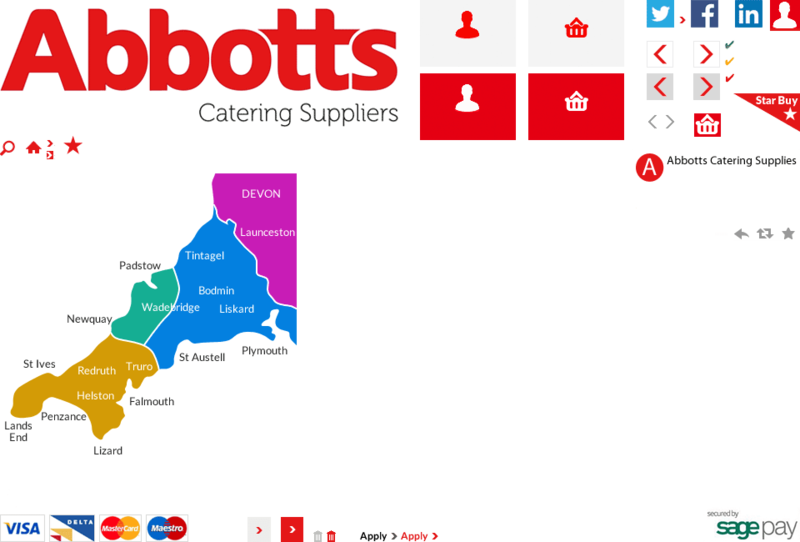 1.2 "Customer", "you" or "your" means any person, or business, incorporated or unincorporated who places an order with Abbotts. 1.3 "The parties" means Customer and Abbotts. 1.4 "Goods" means any items ordered, sold and/or supplied by Abbotts to a customer. 1.5 "Order" means a request to purchase goods from us whether received via the website, telephone or in person. 1.6 "Price" means the price for Goods excluding costs of packaging, delivery, VAT and insurance. 1.7 Quotation means an illustrative indication of price provided to a business customer for the supply of goods under these terms and conditions. 2.1 All orders placed with us will be deemed to be placed under these terms and conditions (and/or any subsequent amendments) which will be the only form of contract between the parties. Any other terms and conditions previously issued inconsistent with these terms and conditions, unless specifically agreed by us, in writing, subsequent to the date of these terms and conditions of sale, shall deemed to be superseded. 2.2 Any and all orders are subject to our acceptance. We reserve the right to refuse an order without explanation or justification. Receipt of payment for goods will not, in itself, represent acceptance of an order. An order placed through our website will only be deemed to be accepted when we contact you by email, telephone or post to confirm acceptance of your order and details of delivery. Until an order has been accepted no contract shall exist between the parties. 2.3 Once an order has been accepted by us it may not be cancelled by the customer without our express written agreement. 2.5 These terms and conditions may be varied by us at any time by publishing new terms and conditions on our website and/or on any brochures. 3.1 The price quoted on the website is the price that is payable for the order. Abbotts reserve the right to change this price from time to time at their complete discretion. The prices quoted on the website are for orders placed with us through that medium only. Occasionally a different price may be quoted in the Abbotts catalogue (provided the catalogue is current) or by a representative of Abbotts to that quoted on the website - that will be the price applicable for that order and the price quoted on the website for orders placed with us through that medium will be applicable to such orders only. 3.2 Occasionally, a price or description may be incorrectly quoted in error. In this circumstance Abbotts shall be under no obligation to fulfil the order on those terms and reserve the right to either amend the order by agreement with the customer or refuse it. 3.3 Sometimes goods ordered in a particular size, colour or design may not be available and we reserve the right to cancel the order or, subject to the customer's agreement, to substitute goods of a different colour or design and/or of comparable or higher quality. On occasions, an item may be out of stock but we will deliver to you as soon as possible upon receipt. 3.4 All prices quoted are in GBP - British Pounds Sterling. 3.5 Prices quoted exclude VAT which will be charged at the rate applicable at time when the order is accepted. 3.6 Prices quoted exclude the cost of packaging and delivery which can be found on the website for web orders or, otherwise, will be advised to you by our representative when your order is placed, if applicable. 3.7 Any quotation provided shall be valid for a maximum of 30 days (unless otherwise specifically stated) and is to be viewed as lapsed. 3.8 Any quotation provided to a business customer is for illustrative purposes only and the price payable will be that applicable at the time of acceptance of the order. 3.9 We reserve the right to cancel any order that we believe, at our absolute discretion, the customer may not be legally permitted to enter into. Abbotts will seek to confirm that customers are over 18 years of age for all items subject to age restrictions such as knives, cleavers or solvents and that they are to be delivered to a person aged 18 or over. By placing an order for such items the customer confirms that they are of an age to do so. 4.1 Unless an approved credit account has been agreed by us, with specific terms set out in writing, payment for all orders is to be received in cash, by credit/debit card or by cleared funds to our account prior to delivery. If you pay by cheque funds will not be treated as cleared until we are satisfied, at our complete discretion, that the cheque may be regarded as cleared and not cancelled or returned for any reason. 4.2 Payment for all orders placed through our website is to be made by credit or debit card only before the order may be considered for acceptance. Payments for all other orders/accounts may be made by cash, cheque, direct payment to our bank account or by credit/debit card - we will be happy to provide details of these payment methods upon request. 4.3 If a credit account has been agreed for a business customer terms will be set out in writing by us and payment terms will usually require receipt of cleared funds by us from the customer by the 15th of the month following the dated month of any invoice/the order which will be determined at our sole discretion. Agreement to credit terms will also be subject to completion and acceptance of our "Application for Credit Terms" and our "Conditions of Sale" documents. 4.4 Business customers, by seeking credit terms with Abbotts, accept that we may undertake credit checks, as we deem appropriate, including, but not exclusive to, enquiries with credit reference agencies and trade creditors. 4.6 If credit terms are provided Abbotts reserve the right to withdraw or reduce the facility or alter the due date for payment, at our absolute discretion at any time, without notice or explanation. 4.7 Business customers have no right of set-off - i.e. you do not have the right to set-off any money that you claim is owed by us against any monies owed by you to us. 4.8 Whilst monies are owed to us we maintain the right to keep and/or sell any property of the customer that we may hold or acquire. 4.9 If a business customer is encountering difficulty in paying us we would urge them to contact us as soon as possible to discuss possible repayment options by telephone on 01209 212794, email at sales@abbotts.info or by post to the company's trading address at the head of these terms and conditions. 5.1 Details of delivery and returns for website orders are detailed on the relevant section of the website. 5.2 Abbotts will always endeavour to meet quoted delivery times and usually do so but they should be viewed as estimates, particularly to offshore and remote locations, and we shall not be liable for any loss or damages resulting from delay in delivery of goods for whatever reason. 5.3 If we have not delivered your goods within a reasonable time from the indicated delivery you may cancel your order with us provided you do so in writing before the goods have been despatched. If you cancel the order you are specifically precluded from making any further claim against us under that contract. 5.4 When delivery of goods is accepted by you after the indicated delivery time it will be on the basis that you have no further claim against us for any delay. 5.5 Under certain circumstances it may necessary that we may deliver goods in instalments. In this instance each instalment is to be viewed as a separate contract. 5.6 We will only agree to deliver to the front door on the ground floor of accessible locations, particularly for heavy or bulky items. Our driver may, at his or her complete discretion, assist with any variation from this determined by the customer at the customer's sole risk. 5.7 We reserve the right not to deliver if we believe it to be unsafe, unreasonably difficult (including unsuitable access for our vehicle or delivery personnel) or unlawful to do so. c) sell the goods at the best possible price readily available to us and, after deducting reasonable costs for any storage, insurance, transport and selling expenses, seeking payment of any shortfall of the price under the contract or accounting to you for any surplus over it. 6.1 All risks in the goods transfer to the customer when delivery has been accepted and they are to be used, installed and stored at the customer's risk. Delivery shall be deemed to have been accepted at the time that goods have been delivered to customer's premises or location designated location or when collected from our premises if the customer is collecting or arranging carriage. Abbotts will not be held liable for any damage, loss or disruption of business caused by goods supplied. 6.2 The customer is responsible for inspecting goods on delivery. Any alleged damage or shortage in quantity must be advised to us within two working days of delivery, in writing, quoting delivery/invoice number and date thereon by post to the trading address at the head of these terms and conditions, email to sales@abbotts.info or fax to 01209 313237. If damage or shortage is identified at the time of delivery please give every opportunity for our delivery personnel to inspect the goods. If damage or shortage is not advised to us in accordance with the above terms it will be held that the goods have been delivered in satisfactory condition and the quantities stated. 7.1 All risks in the goods pass to the customer upon acceptance of delivery but title will not pass until payment has been made in full for them ("retention of title"). c) You must insure them against all reasonable business losses and hold the policy or relevant proceeds from that policy on trust for us. d) You may use goods supplied but not if (i) we revoke that right (by advising you in writing of such revocation) or (ii) you become insolvent (you will be deemed to be insolvent if (A) at any time you are unable to pay your debts as they fall due or (B) you become the subject of any formal insolvency procedure such as administration, receivership, liquidation, winding up or bankruptcy or any voluntary arrangements with creditors or the subject of any application or proposal for any such procedure. 7.3 Business customers are required to inform us, in writing, by email at sales@abbotts.info or by post to the company's trading address at the head of these terms and conditions if you become insolvent and must allow us to remove the goods should your right to use/sell them cease. 7.4 Nothing in these terms and conditions, including but not exclusive to our retention of title, should be construed as negating our right to take legal proceedings to recover the price of goods supplied and costs to do so. 8.1 We warrant that goods supplied are free from material defect at the time of delivery (subject to all terms and conditions). We offer no other warranty (and, specifically, exclude any warranty, term or condition that may otherwise be implied) as to the quality of the goods or their fitness for any purpose to the fullest extent permitted by law) other than the guarantee offered with the terms of the manufacturer’s warranty. For private consumer customers, your statutory rights are not affected. 8.2 Subject to other conditions detailed within “Warranties and Returns” you may return goods supplied for a refund, exchange or replacement provided they are returned at your expense, unused, in the same condition as supplied and in their original packaging with full details of your order within 30 days of delivery. If located within postcode areas TR, PL, EX, TQ, TA or DT we will collect goods for return without charge. 8.3 If goods delivered are reported as faulty/defective in material or workmanship this must be reported to us within two working days of delivery, in writing, quoting delivery/invoice number and date thereon by post to the trading address at the head of these terms and conditions, email to sales@abbotts.info or fax to 01209 313237. Such goods must be made available to us, at our reasonable request, to investigate and if found faulty will be (at our sole discretion and subject to meeting, in full, our terms and conditions) exchanged, repaired or refunded. 8.4 These warranties do not apply to any fault or defect with the goods caused by the fault, negligence or failure of the customer to use them for their normal intended purpose or to adhere to manufacturer’s instructions including but not exclusive to installation, environment, and storage. 8.5 Components such as Electric Lamps, Fuses, Mains Plugs and Leads, Filters, Gaskets, Hoses, Refrigerants, Legs and Castors are only warranted on day of receipt. 8.6 Where goods have been or suspected to have been altered, tampered with or not maintained in accordance with manufacturer’s instructions we reserve the right to invalidate warranties. 8.7 Any goods marked “No Commercial Warranty” are sold as such. 8.8 Notwithstanding anything to the contrary in these terms and conditions, we will not be held liable, under any circumstances, under breach of contract or for any other reason, for any direct or indirect financial loss, loss of profits/business interruption, loss of use or consequential loss or damage irrespective of cause (other than death or personal injury or property damage resulting from our negligence) suffered by you. Furthermore, we will not be held liable in respect of third parties claims against you resulting from any defect in good supplied or any action or omission on our part. Any claim against us caused by our negligence will be limited to five million pounds. 8.9 Any other liabilities not specifically detailed will be limited in damages to the price of the goods supplied. 8.10 Descriptions and images of goods on our website and in our brochures/catalogues are for indicative purposes only and should be treated only as a guide. Such representations will not form part of our contract with you. A name given to a product colour should not be regarded as necessarily representative of the actual colour. We reserve the right to alter descriptions and images without notice. 9.1 The customer, by placing the order, and Abbotts, by accepting the order, acknowledge and accept that they are bound by these terms and conditions and/or any subsequent amendments. 9.2 These terms and conditions and the agreement/contract that they create are governed by English Law and the Parties shall be subject to the exclusive jurisdiction of the English Courts. 9.3 If the order is placed by/on behalf of more than one person all persons are deemed to be joint and severally liable under the terms. 9.4 Invalidity, unenforceability or illegality of any term or provision, either in whole or in part, shall not affect the validity, enforceability or legality of the other provisions which shall remain binding on the parties. 9.5 Force Majeure - We reserve the right to vary or terminate our agreement in the event of circumstances beyond our control : force majeure, Act of God, accident, explosion, war, terrorism, fire, flood, transport delays, industrial disputes, adverse weather conditions or governmental intervention.